Being a superhero is hardwork, and even Kaptain Kinch needs time to relax and unwind. Here are some of the best places in the Kinchbus universe to do just that. Are you a petrol head? Have a need for speed? A day out at the Donington Race Track is sure to be right up your street. As well as being the home of motorsports, including the World and British Superbikes, Donington also hosts some fantastic events including concerts, festivals and exhibitions – the world famous Download rock festival is held here every year. You can also whizz around the track yourself when you book onto one of the brilliant track days available – a great gift idea for the motorsports fan who has everything! skylink runs from Derby, Loughborough and Leicester to Donington 24/7, making it easy for you to get to the park, no matter what’s on. A trip to the National Space Centre in Leicester makes an astronomically brilliant day out for all ages. 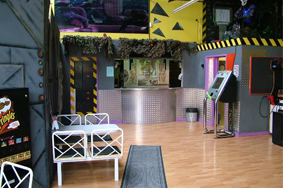 Star gaze in the award-winning planetarium, explore the 42m high rocket tower, head ‘Into Space’ and tour the planets at this amazing, interactive attraction. Catch the 24/7 skylink which goes from Derby and Loughborough to Leicester, or the Kinchbus 2, which runs between Loughborough and Leicester half hourly Mon to Sat, and hourly on Sundays. 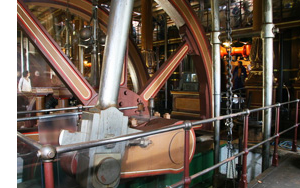 If you’re an inquisitive type, head to the Abbey Pumping Station Museum of Science and Technology. Here you can learn all about Leicester’s industrial, technological and scientific history and heritage, and take an exploration through time, from the days of steam mechanics to the future of space travel. Why not combine with a trip to the Space Centre next door for the ultimate educational and fun day out. Catch the 24/7 skylink from Derby, which stops nearby, or the Kinchbus 2 which runs half hourly between Leicester and Loughborough. Fancy a day out with a difference? Why not take a flight of fancy at the Aeropark at East Midlands airport? While your feet might be staying firmly on the ground, you’re sure to be blown away by just how close you can get to the planes as they land and take off from the main runway. As well as being able to watch the modern planes from the viewing mound, you can also see the planes of yesteryear at the brilliant aviation museum, which includes 26 static aircraft exhibits! Open Thurs, Sat and Sun during summer (May to Sept) and Sun only during winter (Oct to Apr). skylink will get you to the Aeropark whenever you want to go. Take the kids and a picnic for the ultimate high-flying day out! Sports fans need to know how to get to Trent Bridge, as it’s the home of Nottingham Forest FC (City Ground), Notts County FC and Nottingham Rugby Club (Meadow Lane), Nottingham County Cricket Club (Trent Bridge) and many more, including squash courts and the Trent Bridge Library. You’ll also find recreational grounds and a programme of special riverside events as well as festivals at the Victoria Embankment. Whatever your sport of choice, you can travel to and from Trent Bridge on the Kinchbus 9, which runs every 30 minutes between Loughborough and Nottingham, via West Bridgford. If you like trains you’ll love the Great Central Railway in Loughborough, which you’ll find just a short walk from the city centre. Ride a steam engine, dine in the famous Pullman carriage, or maybe even drive a locomotive! The Great Central Railway is where childhood (and adulthood!) dreams come true! You’ll also find a fantastic programme of special events throughout the year, including Santa Steam Trains, Steam and Diesel Galas and Vintage Festivals. Catch the Kinchbus 2 which runs between Leicester and Loughborough, and get off at the Quorn Station stop. The GCRN is a brilliant day out for engine-enthusiasts of all ages. You’ll find this heritage centre, where you can see and ride steam engines and locomotives, in the Ruddington area of Nottingham, and also on site is a miniature railway, a visitor centre and the Nottingham Area Bus Society, home to an amazing collection of vintage buses. It’s a must for vehicle fans! The Kinchbus 9 runs from Loughborough to Nottingham, stopping at the Ruddington Business Park, home of the GCRN, on the way. If you’re a “die hard” film buff or your visits to the pictures are like “when a stranger calls” we have plenty of cinemas around the Kinchbus Universe to fulfil your thirst for the big screen. You can now also get 2 for 1 pizza every Wednesdays from PizzaExpress by simply showing the same Orange Wednesdays text ticket.